Are you looking for some important tourist attractions in Warangal? Thousand Pillar Temple in Warangal is one of the most visited destination by the tourists. The sculpture and architecture is a wonder because of the detachable mandapam. 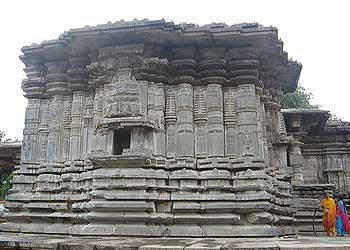 Thousand Pillar Temple is one of the most visited place in warangal. This temple has a long history and dates back to 12 AD. Thousand Pillar Temple is located in the heart of Hanamkonda which is well known for its business importance. The temple is is on the must to see places list for any tourist visiting warangal from India or any other country. The Thousand Pillar Temple in warangal was built by the Kind Rudradeva around 1162 AD who reigned the kingdom between 1158 to 1195. Then Temple is named as Thousand pillars because the central Mandapa which is detachable has more pillars than the entire pillars of the Temple. 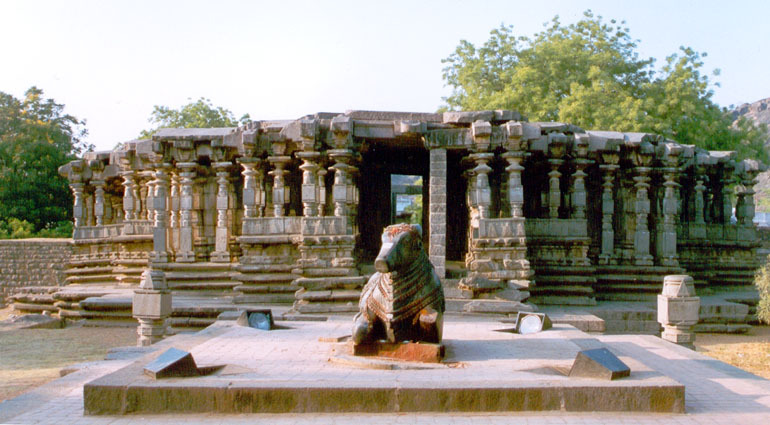 The construction and the style of the temple depicts the architecture and sculpture of the Kakatiyas which gained a great importance during their period. The temple is known for its architecture and style. As one enters the temple you can find the beautifully carved giant Nandi made out of black basant which is monolithic and is adorned with ornaments and garlands which are carved from the stone. There are also many rock cut elephants and other images. As you enter the temple you will find three shrines of around 3 feet height and the central mandapa comprises these. It is believed that a tunnel has been dug from this temple premises to the Warangal fort so that the royal family can travel through the tunnel and offer prayers while the enemy cannot trace them. As of today many of the structure is in fallen but the archeology department has started the renovation work and rebuilding the temple. This temple is being used for Telugu film shootings also. The temple is built in a star shape in the Chalukya style and comprises of three shrines which are dedicated to Lord Shiva, Vishnu and Surya. Because of this the temple central complex is known as the ""Thrikutalayam". The temple is built on the slopes of the Hanamkonda Hills on a 1 meter high platform. The Temple is notable for the richly carved pillars each pillar is carved in such a way that it depicts many pillars engraved in a single pillar. The dancing platform which is viewed from any direction from the central complex is a marvel. The temple entrance has a giant Nandi (Monolithic) which is made from black Basalt is beautifully carved in a sitting position measures 6 feet in height and has chiseled ornaments and garlands. Also you can see the elephants which are cut from the rock. To one side of the temple you will find a pool which is made out of rock is used for cleaning of feet and hands before entering the temple. To the opposite of the temple is a mandapa where devotees gather and spend time in the temple premises. each pillar and any structure is beautifully carved and has uniqueness in the structure. In and around the temple are many gardens and small lingam shrines. There is a well in the temple which is considered very sacred is used for drawing water. The Temple if seen from the North East direction faces the South West Direction. The entrance of the temple is in the South Direction. The entrance of the temple has a mandapa which has three shrines attached to it which are dedicated to the Lord Shiva, Vishnu, and Surya. To the south of the temple entrance is a giant monolithic Nandi.